Beers later shared a studio with her bother James in New York City; and after her husband died, Julie and her daughters lived with William in Brooklyn, New York from 1860 to 1876. In 1876, Beers married physician Dr. Peter Tertius Kempson. Beers and her daughters joined Dr. Kempson in Metuchen, New Jersey, where Beers opened a studio and continued to paint and exhibit her work. 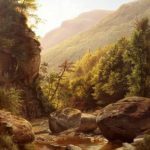 [Julie Hart Beers] became the only woman artist of the century to specialize in landscape. It is perhaps not surprising to find so few women landscapists, since the rigors of painting outdoors and the unseemliness of women engaging in this activity during the Victorian era acted as a deterrent. While largely unappreciated in her own time, through her talent and dedication she produced outstanding works of art and broke ground for the female landscapists who would follow her. 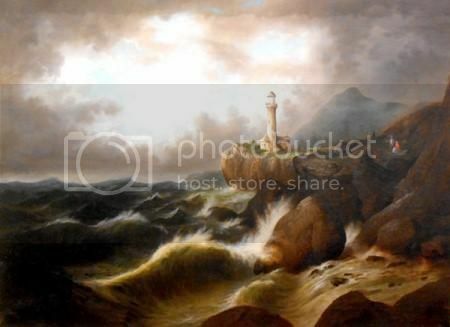 I have never understood why more women did not paint landscape. Historically, hordes of them took views in pencil or pen and ink and wash, but virtually none ever set about making a view into a picture. The six daughters of Scottish landscape painter Alexander Nasmyth [1759-1840] were taught by their father to paint in his second-best manner; they were never encouraged to make compositions of their own. The reason has nothing to do with hand-eye coordination, or missing synapses or dwarfed dendrites in the female of the species. It has to do with authority, with the act of throwing a frame around a feature of the seen world and detaching it. Ann Hall was a painter born in Connecticut in 1792 whose family encouraged her artistic talents. At a young age she experimented with painting flowers and still lifes. 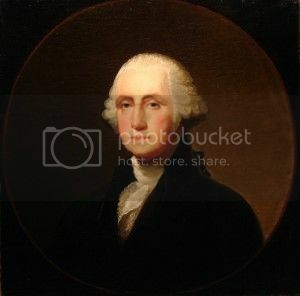 Hall visited her mother’s family in Newport, Rhode Island and learned to sketch and paint in oil and make miniatures in watercolors on ivory from one of Gilbert Stuart’s teachers, Samuel King. Miniatures were considered most suitable for women painters in the early nineteenth century, as they had been in the eighteenth, when Henrietta Johnston (d. 1728-1729) became the first American professional woman artist. In about 1808, Hall studied oil painting with Alexander Robertson in New York City. 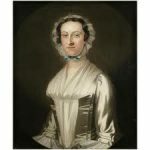 During her tenure at his studio, she viewed paintings of the old masters from the collection of Colonel John Trumbull, painter and private secretary to John Jay. By 1817, Hall was submitting her work to the American Academy of the Fine Arts. Most of her early submissions were miniatures depicting family members. Ann Hall painted this group portrait on a piece of ivory only 4 1/4 x 4 1/4 inches! During the mid-1820s, Ann Hall moved to New York City where she lived with her sister Eliza Hall Ward and her husband Henry Ward. Eliza’s home was a center of culture, and many well-known personalities of the 1820s, 1830s, and 1840s who visited there posed for Ann, thereby expanding her circle of patrons and supporters. 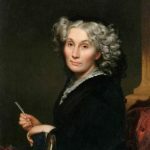 Ann Hall has been described as the most successful miniature painter active in early nineteenth-century New York and has been credited with inspiring a renaissance in the technique of painting miniatures on ivory in the United States. The high prices paid for her miniatures and her popularity during her lifetime attest to the significance of her career. In 1833 she was elected as a full member of the National Academy of Design, the first woman to be so honored. Women painters were active participants in the arts of the new American republic. Art academies began to open in the early nineteenth century, but women were not admitted as students for several decades; they had to learn through private lessons and experimentation. The Pennsylvania Academy of Fine Arts in Philadelphia included women in its first exhibit in 1811. 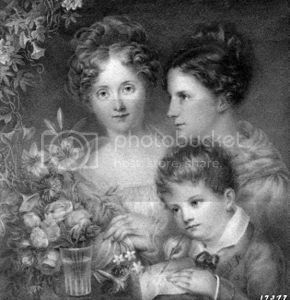 Anna and Sarah Miriam Peale were elected to the Academy in 1824; women were regular students by 1844. At the National Academy of Design in New York, 6 percent of the artists who exhibited between 1826 and 1860 were women. The Academy accepted women on a regular basis from 1846. Gilbert Stuart taught students to paint, but not his own children. His youngest child, Jane worked in his studio, filling in the backgrounds of his paintings, grinding pigments, and learning while he taught others. In time she began copying his works. The Boston Athenaeum exhibited one of her paintings in 1827 when she was fifteen. When Gilbert Stuart died the following year, he was deeply in debt, leaving an estate valued at only $375. Jane accepted financial responsibility for the family. Jane opened a studio in Boston and supported her mother and three sisters by selling copies of her father’s works, especially his last portrait of George Washington, and her own original portraits. From 1827 to 1870, her work was often exhibited at the National Academy Museum and School in New York City and the Boston Athenaeum. In the 1850s, Stuart’s studio burned to the ground, and she moved to her family home in Newport, Rhode Island. She continued to paint, but was always financially strapped. She kept up appearances by continuing to sell her father’s original paintings and her reproductions of them. 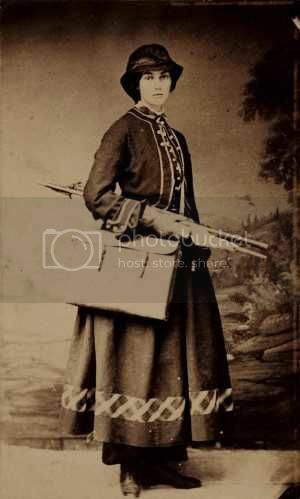 Susan Waters (1823-1900) attended a female seminary in Friendsville, Pennsylvania where she was considered a prodigy. Susan helped pay expenses by providing drawings for her Natural History class at the age of 15. At age seventeen, Susan married Quaker William Waters whose health prevented him from working. As the wife of a man in poor health, Waters, like her close contemporary Lilly Martin Spencer, shouldered the burden of providing for a family and competed in a man’s profession. She received no formal training but learned by experimentation. Therefore, her style continually changed, becoming ever more confident and sophisticated, throughout her life. 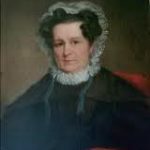 Susan Catherine Moore Waters provided the family income as an itinerant portrait painter, traveling throughout northern Pennsylvania and southern New York for three years (1843-1845). There were other itinerant painters at the time, but very few of them were women. As her portraits provided financial security, she expanded her range of subjects to include landscapes, seascapes, and animals. In 1866, Waters settled permanently in Bordentown, New Jersey. She began to gain some national recognition, and in 1876, was invited to exhibit at the Centennial Exhibition in Philadelphia. One of her paintings, Dr. Lincoln’s Daughters was recently discovered and sold for more than $90,000 at auction – much to the surprise of the owner. It now hangs in the Boston Museum of Fine Arts. Fidelia Bridges was one of the most successful American women artists of the 1870s, when she was elected an Associate of the National Academy and invited to hang her pictures in the Art Gallery of the Centennial Exposition at Philadelphia in 1876. Her artistic life spanned fifty years, from her debut at the Pennsylvania Academy in 1862 until 1912, when she ceased to submit works to public view. She created more than a thousand images and exhibited several hundred of them. During the Reconstruction Era (1863–77), American women began to gain access to increased participation in the world of art – women like Eliza Greatorex, Edmonia Lewis, Vinnie Ream. Fidelia Bridges was one of the few among them to pursue nature almost exclusively. She did close-up studies of grasses, ferns, flowers, and birds, as in Daises and Clover (1871) and Thrush in Wild Flower (1874). Fidelia Bridges befriended American sculptor Anne Whitney and her companion Adeline Manning, a painter from Boston. Whitney encouraged Bridges to pursue her art. 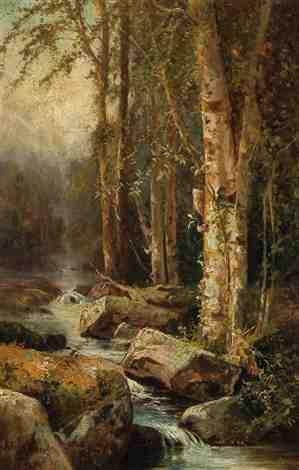 Bridges studied art in Philadelphia with William Trost Richards, who was renowned for his realistic paintings of the White Mountains; he took Fidelia under his wing. She opened a studio in Philadelphia, and collectors began to buy her work. In 1865 she established a studio with Anne Whitney in Brooklyn. At the end of the Civil War, Bridges studied art in Rome for a year; American artists then had to go to Europe to study because there were no public collections of great works of art in the United States. Fidelia traveled with Whitney and Manning, who were part of actress Charlotte Cushman‘s circle of American expatriate women. Fidelia returned to the United States in 1868, where she exhibited her watercolors of flowers and birds at the National Academy of Design. She painted some of her best works in Stratford, Connecticut, where the marshes and meadows along the Housatonic River gave her much to paint. Fidelia’s work can now be seen at the Metropolitan Museum of Art, New Britain Museum of American Art, Peabody Essex Museum and the Wadsworth Atheneum Museum of Art.